Whether you have relocated several times or are just planning your first big move, it pays to take some time to go over tips and tricks shared by professional moving companies and individuals who have moved many times over. Moving locally can be just as stressful as moving across the country. In fact, studies show that it can even be more stressful if you don’t have all of the packing supplies and services you need to pull it off. You can utilize extra services and tools, such as Cape Cod residential storage and professional Massachusetts residential movers to make things go even easier. However you want to move – and wherever you want to go – you can trust Plymouth Rock Moving & Storage to get you there. Before you embark upon your moving journey, make sure to have a good plan in place. If you are making a cross-country or overseas move, you will want to consult with a logistics professional at our office Pocasset, MA. For local moves or moves right here on the east coast, you can probably get by with basic residential moving and storage services. Our team will visit your home and provide you with an accurate estimate for our services. You can choose to include professional packing supplies and services or take care of that part on your own. How you move will all depend upon how much time you have to pack and how much your budget will allow. We have a range of basic to full service moving options to suit every need. As part of your plan, make sure to also create a viable moving list that details all of the things that you need to do between now and your moving day. Include time for packing, whether you are doing it yourself or hiring a professional team to do it for you, as well as a timeline that includes making changes with the utility companies and giving notice to your current landlord, if applicable. Write everything down and save room to check it off of your list once the task has been completed. Start your packing process, whether you are getting packing supplies and services from your residential moving and storage company or not, by cleaning out closets, storage areas, attics, basements, crawl spaces, underneath beds and anywhere else that clutter and belongings get placed. Go through everything and toss out stuff that is broken or no longer needed. Donate or sell things that are in good condition, but that you no longer want or need. 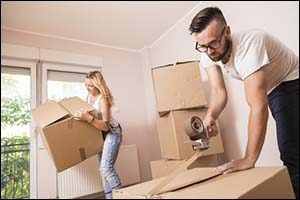 Box up anything that you won’t be using between now and the actual move, such as Christmas decorations, winter jackets and skis in May or gardening tools and pool gear in November. One way to totally lose your mind in the midst of a move is to go looking for something and not be able to find it. That moment of panic and adrenaline when you think you may have accidentally left your Aunt Edna’s china tea set in the upstairs closet of the old house after you’ve already handed off the keys is something that you want to avoid. Label all of your boxes with the room of the house that you want them to go into and write down what is inside on the outside of each box. An example of this would be a box that contains the following information: Living Room – Contains: DVDs, Remotes, Magazines, Family Photo Album, Fake Plants. Use a permanent marker to label all of your boxes and write the room that they belong in on all four sides, as well as on the top of the box. The list of items only needs to be on the top, which will prevent you from opening the Living Room box listed above if you are looking for coffee cups. You should extend this process even to items that you will be putting into Cape Cod residential storage for temporary safekeeping or as a long term storage solution. The more you can label each box, the easier it will be to unload, unpack and settle in to your new home. If you are interested in learning more about residential moving and storage solutions at Plymouth Rock Moving & Storage, give us a call at 1-800-340-0995. Our team can help you with a wide variety of packing supplies and services, Cape Cod residential storage and the professional assistance of our Massachusetts residential movers. Call today for a FREE estimate for your next move.